And here we are at the third and final episode of the pants series. You might wonder why I bother to write all these tutorials when stretch fabrics and jeans have been invading our daily lives … precisely because when we master sewing, we have the privilege to create classic outfits and the luxury to wear well fitted pants. 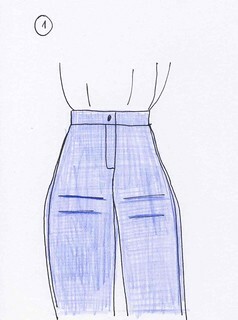 If you have strong legs, your pants made with a standard pattern might tight on thighs and pull the seams forward (Figure 1). If you already have sewn your pants, release the side seams and the inner seams. 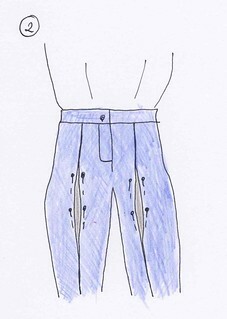 If you made a pair of test trousers (I cannot congratulate you more), cut your front pants from waist to knee and pin the slot edges on additional fabric strips (Figure 2). If you overeat foie gras and chocolate during the holidays or if fries and beer are your daily menu, you might find difficult to close your pants and the belt seam might pull down (Figure 3). 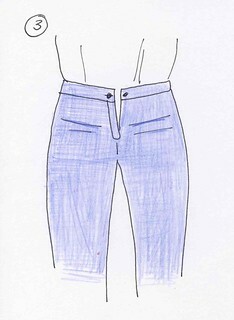 On your already sewn pants, all you can do is to release the side seams at the belly. 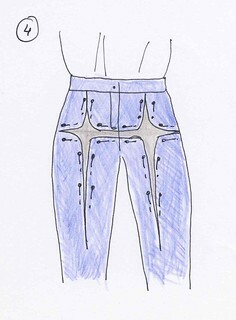 On your test pants, make a vertical cut on the front from the waist to the knee and an horizontal cut at 15 cm below the waist from one side seam to another. Add the necessary breadth and pin the slot edges on additional fabric strips (Figure 4). If you still have problems with your pants, read the first and the second part of this series, and if the problem persists ask a friend with a fresh eye to check the pants fitting. Because of too much reading about pants problems you may see pleats all around. These tutorials have been inspired by the book “Burda, a practical sewing guide” published in 2005 by Fleurus that I simplified and redesigned for you. It was my gift for you for the New Year (the tutorials, not the book). So, will 2014 be the year of trousers for you? This entry was posted in Tutorials and tagged fitting, pants. Thank you so much for the generous gift of your knowledge and time! I have been reading your tutorials on fitting trousers with much delight! I am in the process of fitting a test pattern, I took your advice and made a test pair out of fabric scraps. Thank you again!!! You have a wildly funny sense of humor! A joy to read. This is amazing information. I have sewn for many years but recently have begun to sew clothing (mainly trousers) for my grandson. He has some sensitivities to the way things feel so can’t wear anything tight to his skin. He also has problems with his fine and gross motor skills and cannot do buttons or zippers. He is also a giant of a child. He is very tall for his age and just big all over! It was so hard to find suitable trousers for him, especially now that he is out of children’s sizes. I found a pair in the store that fit when he was able to wear children’s size still. When he grew bigger, I took that pattern and made it a bit bigger and made trousers for him. This has gone on for several years now. But this year I cannot seem to make my pattern fit him anymore. The pants pull down in the back whenever he sits down. I don’t have enough experience in pattern making to know what I need to do to correct this problem. I think I have gained some ideas from your tutorials. I will try to reshape the behind and also reshape the crotch and thighs in the way you have shown. Thank you SO much for sharing your knowledge so freely. C’est tres gentil et bien organisé! Merci mille fois! Adoro todas as suas publicações. Sou grata por postar estas explicações sobre calças, como sempre fiz minhas roupas, percebo que agora minhas calças não têm um caimento elegante na parte de trás, não estou acima do peso, mas na parte do quadril o tecido puxa para baixo e nas laterais formam-se rugas em direção ao joelho. Olá, obrigado por sua lealdade. infelizmente eu não entendo Português, mas se você me enviar uma foto de suas calças para mim entender o problema, talvez seja mais fácil para mim para ajudá-lo. Hi. Have you advice on taking extra fabric from below buttocks to back of knees. Have drafted a pattern but there’s “bagginess” below my backside that I would like to get rid of. Draft was from Winifred Aldridge. Have already taken in legs from crotch to ankles. Thank you. Pauline Walsh. Hi Pauline, my advice could only be approximative as I don’t “see” the pants. however, you can try to reduce the center back curve? Ok i understand but pls show the paper pattern for better u/standing. And they were very expensive. Maybe you should teach a lecture about getting, your best fit in the fitting room. No one wears one size anymore. Thank you MaryAnn, I also think that clothes should all be made to measure, at least the peaces that are meant to last. Great explanations, but I have one extra problem area. I have a horizontal fold of fabric on the side seam which is more evident from the side and the back. From the front the side seam looks flat. I have tried taking out a wedge at the back but it still appears, so my thinking is now that the trouser is too tight. By taking out the wedge I am straightening the side seam which is just making the problem worse. Brilliant. Thanks so much for clarifying all of this! Not only it is very useful information but I enjoyed reading every word of it! Thank you! I cannot believe that this information has been available to me since 2014 and I have only just found it! It is the clearest and most detailed tutorial I have found and clears up all those nagging fuzzy doubts I had about the methods suggested in the many other tutorials I have tried. Thank you. I have followed you advice and ended up with a well fitted pair of ‘trial’ trousers. However, when I start to walk the fabric is tight across my thighs. How can I alter this?